I've been stuffing a lot of things lately. Mostly my mouth, but tomatoes, pastries and peppers come to mind as of now. Now is the height of the tomato season. People are handing me baskets full of German Johnsons, Purple Cherokees, yellow teardrops, Camparis, heirlooms, and many other varieties of which I've never heard. I've done my part by using as many as I can. Stuffed tomatoes is the next step above sprinkling salt, pepper, slicing bread, spreading mayonnaise and handling a knife & fork with a napkin. Slice off tomato tops and scoop out pulp and seeds. Chop coarsely and reserve pulp, discard seeds. Rest hollowed-out tomatoes upside to extract juices, about 15 minutes. Meanwhile, in a medium bowl, mix together bread crumbs, garlic, basil, pepper, 1/4 cup of grated Parmesan, 1/4 cup Asiago cheese and reserved tomato pulp. 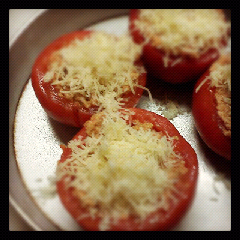 Stuff tomatoes with the filling, sprinkle with remaining Parmesan, and bake until tomatoes are cooked through and tops are golden brown, about 30 minutes. Do you like puff pastry? I do. I don't particularly like making it (too much turning and waiting and hoping and smearing of butter that has been wrapped in plastic and beaten into submission) but I like buying it and eating it. 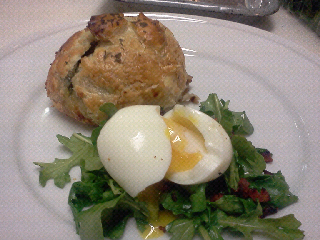 There's nothing like [insert anything] wrapped in puff pastry. It's like a hot, flaky, buttery gift for dinner. Below is sea bass wrapped in puff pastry. Inspired by Le Cirque's famous sea bass, I was in no mood to thinly slice potatoes or reduce wine. I was, however, in the mood to stuff spinach, sliced garlic, butter, and chopped chives inside this puff pastry with a nice quadrant of Chilean sea bass (which is REALLY expensive). I added a wilted (not so much wilted as the fact that I left the greens out on the counter for a few hours) salad of arugula, lardons of bacon and a trendy soft boiled egg. There's something about runny egg yolk that makes me cringe and feel awful about the waste of time spent on undercooked eggs, but everyone seems to like their eggs like this, so here we are. Runny-yolked eggs. On peppery arugula. With bacon. The bacon is the saving grace of the egg.